The theory of phase transitions is generally attributed to thermodynamic systems. 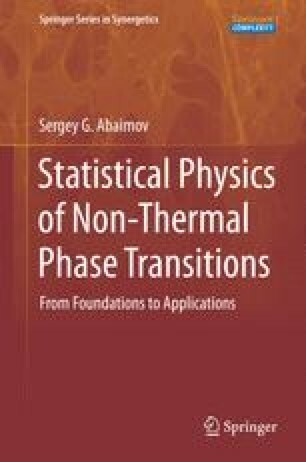 However, in the second half of the last century many nonthermal systems have been discovered whose behavior resembled the theory of phase transitions in statistical physics. However, these systems belong to such diverse sciences—biology, geology, engineering, chemistry, mathematics, economics, social sciences, etc.—that their unified classification seems to be impossible. Examples include but not limited to the percolation of petroleum oil in a rock, polymerization, damage of engineering structures, earthquakes, forest fires, snow avalanches and landslides, traffic jams, chaotic systems, strange attractors, informational processes, self-organized criticality, etc. To distinguish such systems from the classical examples of phase transition phenomena (like the Ising model), the term “complex” has appeared. However, beyond the fact that all these systems obey the rules of phase transitions and, therefore, can form universality classes, their common rigorous classification is deemed to be currently impossible. We see that the term “complex” is collective and, therefore, may describe a great variety of phenomena. But what does this term mean? First, as we have said, calling a system complex, one generally assumes that this complexity is the consequence of a phase transition (or a bifurcation, catastrophe, nonanalyticity, etc.) present in the system. Second, the term “complex” is generally used to distinguish the nonthermal systems from their thermodynamic analogues. Summarizing, we call a system complex if it possesses a phase transition but is nonthermal. In the sense of this definition, the Ising model is only partially complex—it possesses a phase transition but is thermal. In this chapter, as a first example of a “completely complex” system, we consider a phenomenon of percolation. The fact that the system is supposed to be nonthermal means that fluctuating behavior is no longer described by thermodynamic fluctuations. Instead, the system must possess another source of stochastic behavior, forming nonthermal fluctuations. Once the nonthermal fluctuations are generated, our main purpose is to map these fluctuations on their thermodynamic analogs so that the well-developed formalism of the theory of phase transitions in statistical physics may become available for their description.